(CNN) - You don't see poll numbers like this very often. With three and a half months until Election Day, Democratic Gov. Andrew Cuomo of New York has a 37-percentage point lead over his GOP opponent, according to a new Siena College survey. The poll, released Monday, also indicates that nearly half of New Yorkers want the implementation of Common Core standards stopped rather than continued. According to the survey, 60% of likely Empire State voters say they're backing Cuomo, with 23% supporting Republican Rob Astorino, and 17% undecided or backing someone else. More than six in ten say they have a favorable rating of Cuomo, with half saying they approve of the job he's doing in office. By a 54%-38% margin, voters say they are prepared to re-elect Cuomo to a second term in Albany. Astorino has a 20%-19% favorable/unfavorable rating, with more than six in ten having no opinion. "With a little more than a hundred days until voters go to the polls, Astorino has a gigantic hole to climb out of to even make the race for governor competitive. 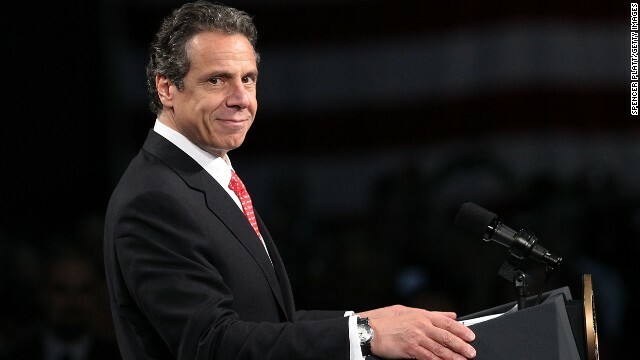 Cuomo currently has the support of 80 percent of Democrats, 56 percent of independents and 32 percent of Republicans. Cuomo's lead among independents is larger than the lead Astorino has among Republicans," said Siena College pollster Steven Greenberg. "Cuomo's lead among likely voters is 76 points in New York City, 29 points in the downstate suburbs and 15 points upstate." Cuomo held a 59%-24% lead over Astorino in a recent Wall Street Journal/NBC 4 New York/Marist Poll. Opt out of Common Core? By a 49%-39% margin, New York voters want to see implementation of the Common Core standards stopped rather than continued. The standards apply to students in kindergarten through 12th grade in the subjects of language arts/literacy and math. Since 2010, more than 40 states have signed on to the initiative, which is sponsored in part by the National Governors Association. But many conservatives nationwide are opposed to the standards, and some states are opting out of Common Core. "While a majority of New York City voters and a plurality of Democrats think Common Core standards should continue to be implemented, a majority of Republicans, independents and upstaters, and a plurality of downstate suburbanites think implementation should be stopped. A majority of white voters want implementation stopped, a majority of black voters want implementation continued, and Hispanic voters are evenly divided," Greenberg added. The Siena College Poll was conducted July 13-16, with 774 likely voters in New York State questioned by telephone. The survey's overall sampling error is plus or minus 3.5 percentage points. We're talking NY here, right? No surprize. I'm thinking that's what krauthammer looked like a hundred years ago! Wow, this is news? A far left Democrat loon is ahead in an election in a far left loon state. Hold the presses!